AT least three foreign insurers seem to have initiated moves for their Malaysian units to meet the minimum local shareholding requirement of 30% amid regulatory pressure for foreign-owned insurers to do so by end-June next year. Singapore’s Great Eastern Holdings Ltd and the UK-based Prudential plc are looking to sell strategic stakes in their local units and are currently in talks with local institutional investors, while Tokio Marine Holdings Inc may opt for an initial public offering (IPO) and has hired Kenanga Investment Bank as its sole principal adviser for the potential exercise. Kumpulan Wang Persaraan (Diperbadankan) (KWAP), the country’s second largest pension fund, is in early talks to buy stakes in the local units of Great Eastern and Prudential. “We have obtained Bank Negara Malaysia’s approval to talk to Prudential and Great Eastern. We are at an early stage of negotiation, so I can’t say more,” KWAP CEO Datuk Wan Kamaruzaman Wan Ahmad tells The Edge. According to sources, Credit Suisse is advising KWAP on the potential acquisitions. KWAP had, as early as August, acknowledged that it was interested in taking small stakes of possibly 10% in some foreign-owned insurers. At the time, it narrowed its options to units owned by Great Eastern, Prudential and AIA Group Ltd. Meanwhile, the Employees Provident Fund (EPF) has its eye on the same two companies that KWAP is looking at. EPF deputy CEO of investment Datuk Mohamad Nasir Ab Latif told NST Business earlier this month that the fund was looking at buying stakes in Prudential Assurance Malaysia Bhd and Great Eastern Life Assurance (M) Bhd. Nasir was reported as saying that it was too early to say how big a stake the EPF planned to buy in the companies. He said the EPF did not know whether the insurers planned to sell a 30% stake to just one party or split it among several. “We really don’t know. If the price is right, we will get 30%. But they may not give all to us,” he told the daily. As at the end of last year, the EPF had an investment fund size of RM731 billion while KWAP had RM125 billion. Foreign insurers are scrambling to find ways to pare down their stakes in their local units after Bank Negara, in June, took a strong tone in reminding them that they needed to meet the minimum local shareholding requirement of 30% as part of a bigger initiative to lift domestic participation in the industry. It instructed them to comply with the requirement by June next year. In 2009, Malaysia raised the foreign ownership cap for insurers to 70% from 49% previously. At the time, the central bank said a higher cap of more than 70% would be considered on a case-by-case basis for players who could facilitate the consolidation and rationalisation of the insurance industry. In the past, it had granted extensions to insurers that did not comply with the foreign ownership. According to RAM Ratings, there are 11 insurers in Malaysia that are wholly owned by foreign firms. “I think most would prefer to sell a strategic stake in their companies to one or two local parties rather than go for an IPO. If they had wanted an IPO, they’d have done so a long time ago,” observes an investment banker. Nevertheless, it is understood that Great Eastern, Prudential and Japan’s Tokio Marine are considering all options available to them to meet the 30% local shareholding requirement. All three have wholly-owned general insurance and life insurance operations here. Paribas as its international adviser for trade sale or, in other words, mergers and acquisitions. “It remains to be seen whether it will actually go for a listing. But like all the foreign-owned firms now, they need to be seen to be doing something to address the 30% shareholding issue,” an investment banker says. Just last month, Hong Kong’s AIA Group chief executive and president Ng Keng Hooi was reported as saying that the group was not in any discussion to reduce its stake in its Malaysian operation. It wholly owns AIA Bhd. And two months ago, it was reported that the US-listed insurer Chubb Ltd was considering paring its stake in its Malaysian unit, Chubb Insurance Malaysia Bhd, to comply with the Bank Negara ruling. CIMB Research, in a report last Tuesday titled What if foreign insurance players list in Malaysia?, says it believes certain players may list on Bursa Malaysia to meet the 30% requirement. “The potential listing of foreign insurers could expand the size of the sector but it could also drain liquidity from existing insurance stocks, in our view,” it says. There are 23 general insurers and 14 life insurers in Malaysia. 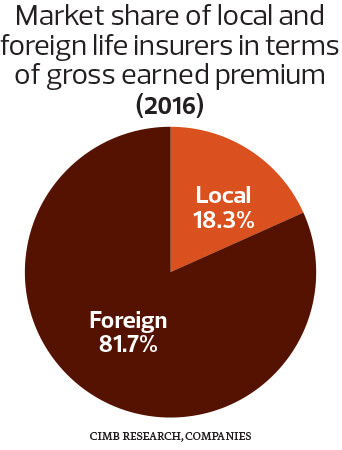 In the general insurance segment, the market share of local and foreign players in terms of annualised gross earned premium last year seemed even with local players accounting for 52.1% and foreign players, 47.9%. However, foreign names dominate the life insurance segment with their market share at 81.7% and that of local insurers at just 18.3%. The three major foreign-owned companies that dominate life insurance are AIA, Great Eastern and Prudential, which have a combined market share of 66.7% in terms of gross earned premiums, CIMB Research says. “We use the average price-to-book value of 2.3 times for past acquisitions of insurance firms in Malaysia to value the foreign insurers (based on the latest book values). Based on this, we estimate the three big foreign life insurers would have a total market capitalisation of RM19.1 billion, of which RM10.9 billion would be for AIA, RM4.1 billion for Great Eastern Life and RM4.1 billion for Prudential. If the major shareholders sell a 30% stake in each, the total proceeds raised would be RM5.7 billion,” CIMB Research says, based on a scenario analysis.